Please visit our Work At Home Message Board! Do you already have an online business? Are you looking for ways to start? 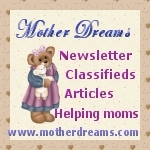 Visit the FREE online home-based business resource center for work at home moms. InternetBasedMoms.com has tips for choosing an online business, building a web page, search engines and promoting your business online. Woman's Work-Visit the complete flexible work resource NOW!